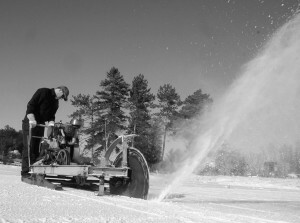 Garrett Foster makes the early morning first cuts with a 1939 ice harvesting saw. Photography by Mark Kurtz except where noted. 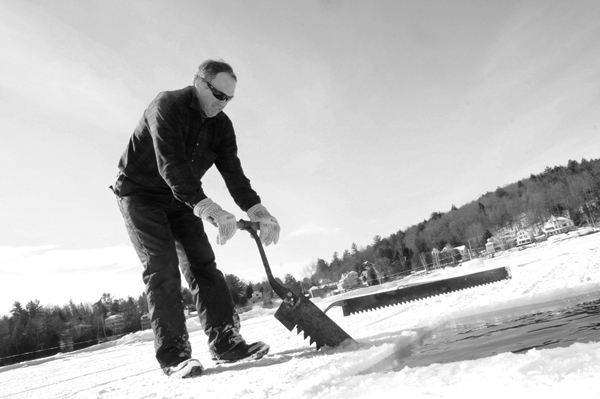 Construction of the Saranac Lake Winter Carnival ice palace has begun, with one aspect of the building process being no different than it was 75 years ago, the ice harvest. Garrett Foster, Michael Knapp and Mark Weller meet early in the morning at Sturdy Supply in downtown Saranac Lake where a 75 year old motorized saw is cranked up for another day of ice cutting. The saw is kept inside overnight so it will start more easily in the morning. Garrett carefully guiding the saw along the previous cut’s straight line. Once it’s started it is transported on a small trailer over to Pontiac Bay on Lake Flower, still running – they don’t dare shut it off. It is slid off the trailer and onto the ice where Garrett takes control of it and begins the process of cutting ice – 500 blocks for this past Sunday morning’s work, 400 blocks the day before. By mid afternoon all the blocks will be high on the walls of the 2013 ice palace. 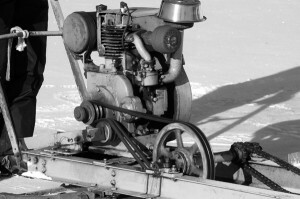 The 1936 Wisconsin 9 hp engine that powers the ice harvesting saw. The saw has a long and storied history. The engine is a 1936 9 horsepower Wisconsin. 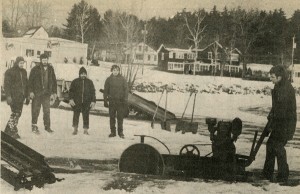 The saw was built in 1939 by Harry Duso to cut ice on Crescent Bay on Lower Saranac Lake. Harry then stored that ice and sold it during the summer from his store and marina to campers on the “lower lake” and to those staying at Duso’s cabins. That saw also saw use cutting the ice for the ice palace. Harry’s son Don took over cutting the ice for the ice palace in the mid 50s and continued to 2004, using the saw Harry made. 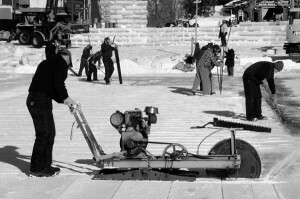 A photograph from the January 14, 1980 Adirondack Daily Enterprise of Don Duso cutting the ice on Lake Flower for the Saranac Lake Winter Carnival ice palace. Recognizing his own limitations with age, Don took Garrett under his wing and started training him on the saw. Garrett took over in 2005 and has been doing it since…with the same saw. Don Duso on the right, giving some sage advice to Garrett Foster in 2006 on how to handle the saw. Michael Knapp is the primary “mechanic” for the saw. His philosophy on maintaining the saw is “if it ain’t broke, don’t fix it”. Michael said that he really doesn’t do much more than change the oil. “It’s a very simple machine – there isn’t much to it and it doesn’t take much to keep it going”. The blade is sent out to be sharpened every year. Unless they hit bottom with one of the first cuts, which is near shore, it doesn’t need to be resharpened throughout the cutting for the palace ice blocks. 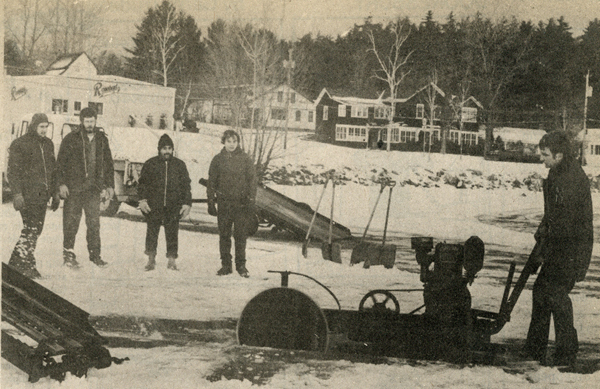 The only thing this Saranac Lake museum piece is used for is cutting the ice for the ice palace. With the antique saw making the initial cuts, ice palace volunteers in the background use vintage ice cutting hand tools to finish harvesting the ice for the Saranac Lake ice palace. The first day of cutting, a chalk line is snapped on the ice to get the first cut straight. Everything after that is based on sliding the saw along the previous straight cut. 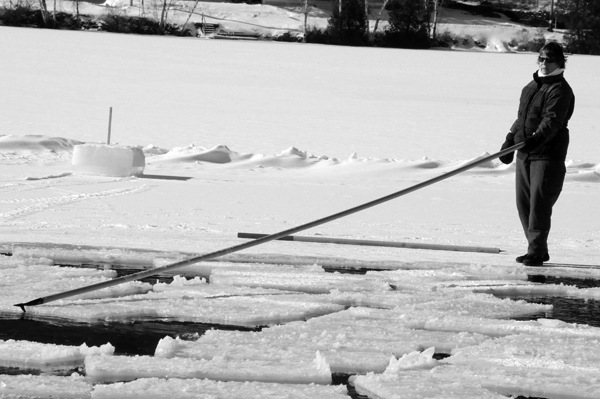 First going the length of the ice field and then crossing at a 90° angle, creating a grid of 2′ by 4′ cuts in the ice. 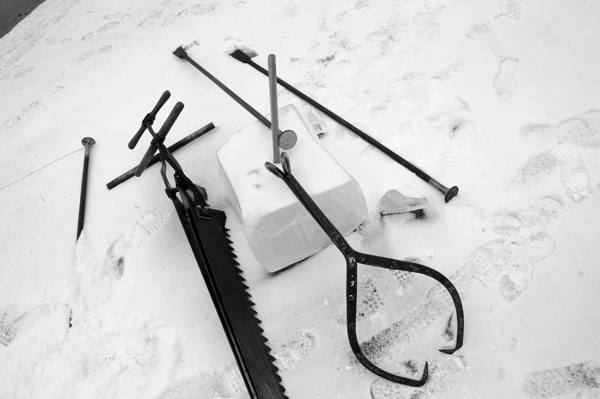 The saw can cut a depth of 11″ but so far this year it has been set to only cut 9″ deep – there needs to be enough ice left so the workers using the hand saws and “spuds” (kind of a long crow bar used to split the already scored blocks away from the ice field) can safely walk on it. Michael Knapp winches the vintage saw onto the trailer at the end of a morning’s work. 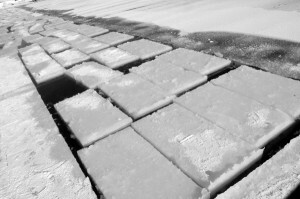 The ice blocks are only 12″ thick because the warm weather this January didn’t allow for much ice to grow before starting to build the palace. The builders won’t start to cut until it is at least 12″ (anything less than that the blocks break very easily) It got to that 12″ bare minimum this past Saturday. 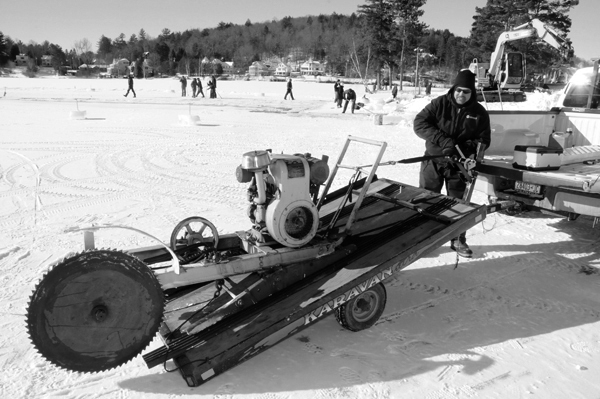 Bill Madden uses a vintage ice cutting hand saw, finishing the cuts made by the power saw, to cut 2’x4′ ice blocks on Lake Flower. After the circular power saw cuts are made, a hand saw, also of antique vintage, is used to cut all the way through the ice, but only every three blocks. 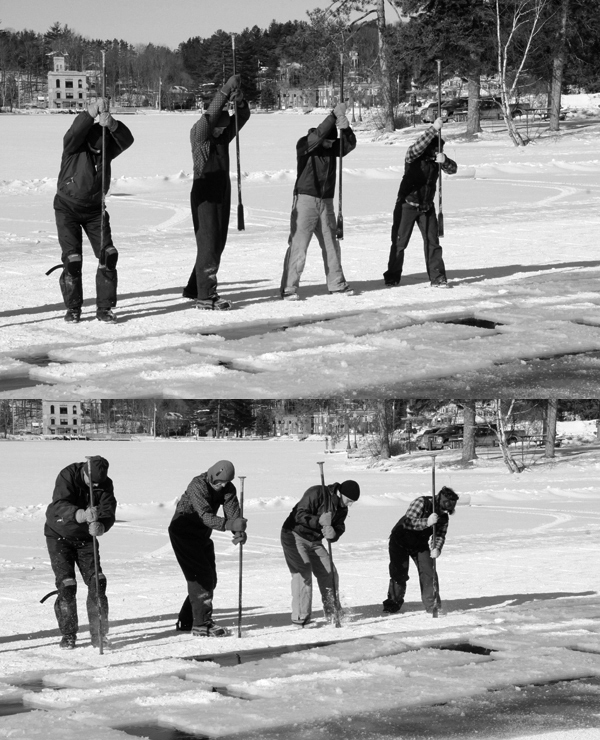 A crew of 4 volunteers use spuds to strike the ice in unison in the partial cut made by the circular saw, breaking the ice blocks away from the field. Then three or four palace workers, on a count of three, hoist spuds as high as they can, straight up from the ice and plunge them down into the crack the circular saw had made, splitting that iceberg of three blocks away from the ice field (now you understand why there is some ice left by the power saw for workers to walk around on!) Then a spud is slammed down into the cracks of the cross cuts in the three block long pieces splitting each block apart from the others. The moment the spuds stike the cut created by the circular saw and break the large block of ice from the ice field. Marilyn Corson using a pike to move the ice blocks to the edge of the bay where they are pulled from the water for the ice palace. The 2 foot by 4 foot blocks are then floated toward the edge of the bay by “polers” using pikes, (long poles with a hook and a pick on the same end) to control where they go, to where they are plucked from the water…that is where modern machinery takes over. Volunteers Martha Watts and Ryan Murray guide the ice blocks with pikes to the edge of the bay where they will be pulled from the water with modern equipment. Some of the vintage hand tools used in harvesting the ice on Lake Flower in Saranac Lake. The ice blocks floating in Pontiac Bay until they are plucked from the water for the 2013 ice palace. The blocks used for the ice palace are about twice the size as what was harvested 75 years ago. At that time, ice had a value and it was stored until the summer when it was then used to keep perishable items cool. Ice was not just used locally, but was also shipped out of the Adirondacks. Stories have it that Adirondack ice found it’s way to the drinks of urban socialites in places like New York City. Early ice palaces were not left to melt as today’s are. The ice in an ice palace, already cut and removed from the lake, and being a valued commodity, was not going to be left to melt. 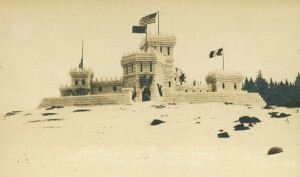 The palaces were disassembled and the ice put into storage for use the following summer. 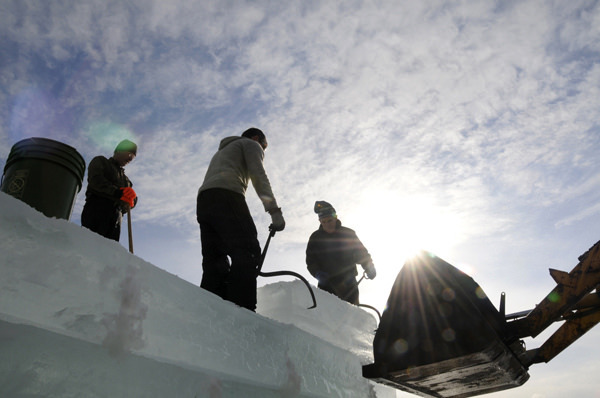 At that time, harvesting the ice for the ice palace was put out to bid. Early 1900s ice palace. Photograph by William Kollecker. Architects designed many of the palaces. They were quite elaborate and there were a couple of years where they were hauled up to the top of Slater Hill, where the North Country Community College administration building stands today. Today’s ice palace is built entirely by volunteers. There are day crews, those that are in a position to be away from work during the day, night crews, those that show up the minute they are done at work and weekend crews, which is everyone. This year’s ice palace will be a little smaller than originally planned – the warm weather earlier in January has reduced the work time to only one week. Usually two weeks are taken to build a palace. Ice palace chairman Dean Baker said the original design called for 2000 blocks. How many this year? Baker said “It depends on the weather. We’ll cut ice right through Friday if the weather allows us to.” The official lighting of the palace and opening fireworks takes place Saturday evening at 7:00 so it all has to be ready to go by then. 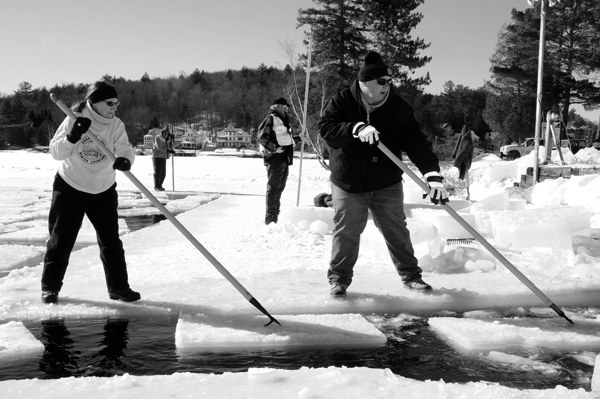 Saranac Lake is not the only place in the Adirondacks where ice is still harvested. Caperton Tissot, author of “Adirondack Ice, a Cultural and Natural History” said there are several ice harvests in the Adirondacks. The New Bremen Volunteer Fire Department harvests ice each year and sells it as a fundraiser in the summer. 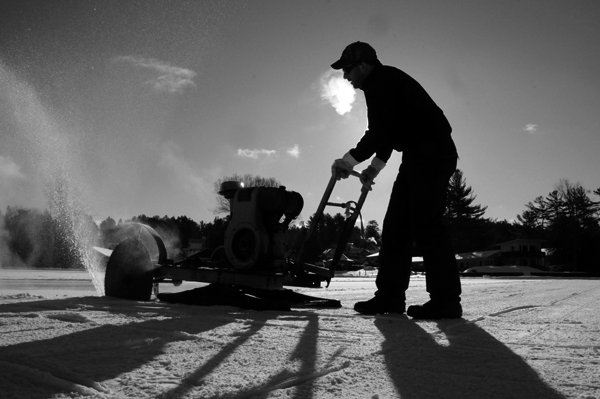 Jim Dillon on Raquette Lake has carried on a tradition from the family business. The Raquette Lake Supply Company was one of the largest commercial ice companies in the Adirondacks, shipping ice by New York Central Rail to New York City…undoubtedly where some of those New York socialites enjoyed it in their cocktails. 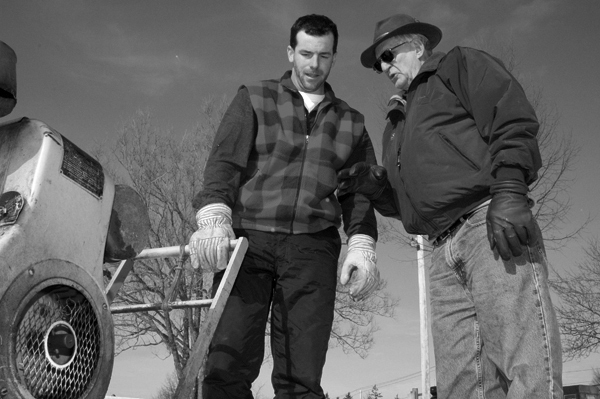 Dillon, a descendent of the original owner, still has a one day ice harvest, mostly to carry on the family tradition but he does use it in his store, which is still called the Raquette Lake Supply Company. According to Tissot, there is one Long Lake camp owner that does a private ice harvest every year and there are some Great Camp owners who still have their caretakers harvest ice for their guest’s cocktails in the summer. 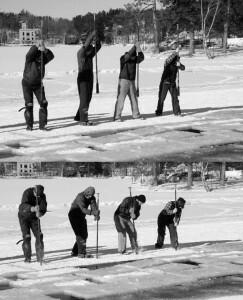 Tissot reports that the Underwood Club in North Hudson has, in recent years, done an ice harvest each year. So, it is possible to step back 75 years on the shore of Lake Flower (next to the NYS DEC boat launch) and witness ice harvesting as it was done “back in the day”. Garrett starts his cutting with that 75 year old vintage saw around 8:30 in the morning and, depending on how things go that day, finishes up around 9:30 or10. The work with the hand saws, spuds and pikes will go on for a little awhile after that and work on the palace itself goes into mid-afternoon and then picked up again in the evening. It is expected that ice cutting will be every morning this week but the forecast of warmer weather midweek could change that. 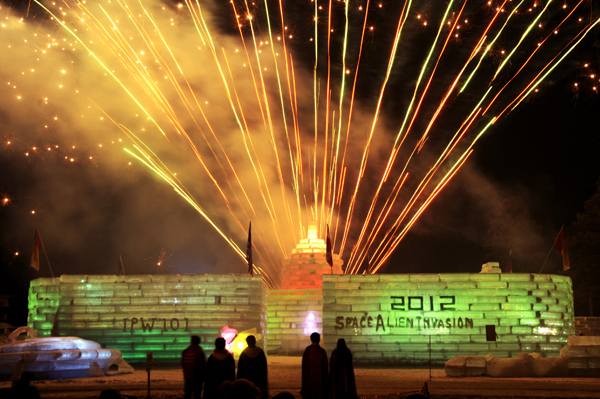 End result – the 2012 Saranac Lake Winter Carnival ice palace at the opening fireworks. 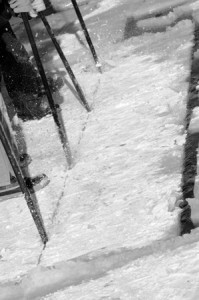 A complete schedule of the Saranac Lake Winter Carnival can be found at saranaclakewintercarnival.com. 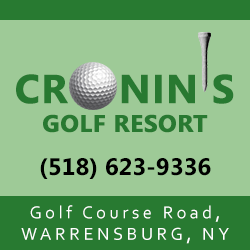 Updates including photos of the day can also be found at that web site and the Saranac Lake Winter Carnival facebook page. This is very interesting and well-illustrated, Mark. Very well done Mark. Thanks for including me in it. We look forward to doing this every year! Interesting historical info! Looks like a lot of work, then and now. Thank you, Mark! What great history and great photos! Mark, Great story and pictures. My family had been in Saranac Lake (Harrietstown) since mid 1850’s. Love these historical stories. Thank you so much. Fascinating post, Mark. What a great piece of history living on in your wonderful small town. Perhaps we’ll make it up early enough some year to see that 75 year old saw in action! What an interesting article!!! I am married to a native of Gabriels/Saranac Lake area, but have never been to this wonderful celebration. So this was very informative, much more than the stories i have been told. Keep up the good work. Do you have photos of other ice castles from the past?? That would be an awesome album to share.